The Port of Pittsburgh’s state-of-the-art wireless network will eventually allow a myriad of users to collaborate, improve operations, maritime safety, security and a host of other tasks. Really: the cloud is the limit. This story weaves technology, leadership and innovation – all of it happening on the waterfront. The inland waterfront. If this sounds like something more closely associated with bluewater container shipping logistics, then you can be forgiven for getting lost in the moment. That’s because, and as inland shipping claws its way into the 21st century, the Port of Pittsburgh is also moving at the speed of a robust broadband connection. 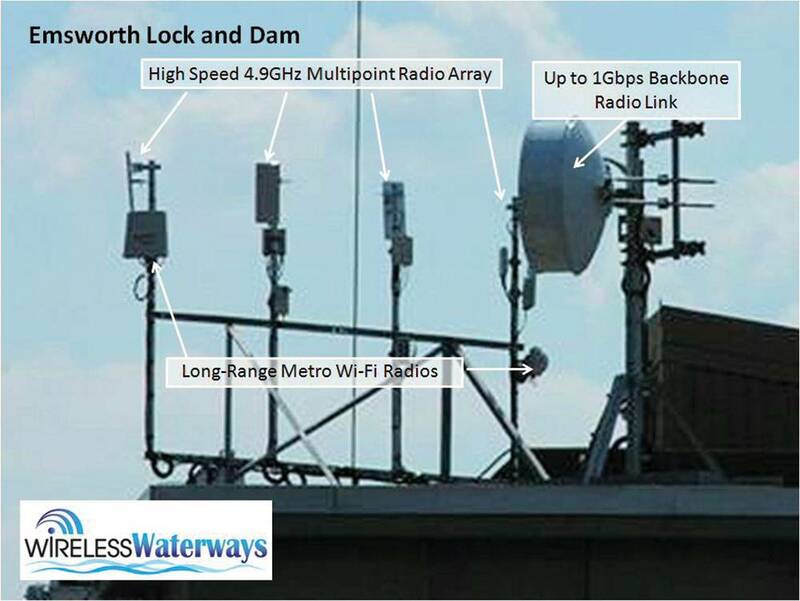 They call it the Wireless Waterway. We call it smart. The Port of Pittsburgh commission was created in 1990, which it makes it a fairly young entity as maritime organizations go. At that time, the port was fully functional – all through private industry located along the waterway. Hence, the Commission was not created to make another terminal or port complex. Instead, it developed as a function of private industry that was looking to promote the use and development of the waterway. The Commission, in turn, began looking around at a number of things that it could do to help industry. Early on, these efforts typically involved grants and economic development assistance tools. Out of that effort came a system the port now calls “SmartLock” – a virtual locking system similar to that which allows airlines being able to land on instruments in zero visibility. Jim McCarville explains, “We still need a pilot but it (the system) gives precise measurements. The same thing holds true for lock approaches. This is something that would improve navigation. Early on, it became obvious that we’d need a network to distribute the signals and you couldn’t do it lock by lock. It had to be a system. And, you don’t build a system or network to do only one thing.” McCarville’s explanation is the key to what will come next. In June 2012, the port contracted with CONXX, Inc. to begin work. By December, McCarville says that the network will extend from the Emsworth Dam on the Ohio River to the Braddock Dam on the Monongahela River to Lock No. 2 on the Allegheny River. The port doesn’t have funds to go beyond Pennsylvania but is now seeking partners, grants and investors to go beyond the initial areas of coverage. The cost of the Pittsburgh area wireless system will reach $1.3 million, funded in part by $975,000 in federal Port Security money, with the Port of Pittsburgh underwriting the rest. A many-layered, Collaborative Maritime Domain Awareness Community, with four major attributes: a safe, secure, fixed and mobile, trusted Wireless Broadband Network for the waterways; an Interoperability Developmental Test Bed to test and improve products; a broad based Waterway Portal; and multiple Private Networks. The project is modular and scalable and can be extended across the Nations Inland Waterways. The core goal is to provide an agnostic, wireless, broadband network, with multiple frequencies, that will facilitate and improve maritime security by connecting proprietary, and stove-piped, and stand alone systems into one “system of systems” that improves Maritime Domain Awareness (MDA). Structured to expand as needed, the system is set up to engage and serve the entire community. For example, environmental agencies and highway departments with sensors on bridges could tie in. So, too, could a myriad of law enforcement and homeland security efforts, linking each to a fusion center to better coordinate any number of services. Networking existing cameras within range of a facility, delivering that feed to the Captain of the Port and/or law enforcement, makes all that camera investment even more valuable and effective. Even Carnegie Mellon has a research project that will leverage the available bandwidth. A common view could be part of the future of the wireless system. For towboat operators, engine performance could be transmitted back to the home off in real time, e-learning could become a reality for mariners and ECDIS charts transmitted and updated more frequently. And, mimicking the new service being testing by a firm called ARGUS (see MarineNews December 2011 edition, BY THE NUMBERS, page 12); towboat operators might someday be able to take advantage of the depth sounder on the boat in front of them. Beyond this, Internet access for crews and boat business could expand to obviate the cost of expensive satellite services. Eventually, says, McCarville, the Wireless Waterway could be a revenue generating enterprise that could expand beyond itself. Users would pay for access to the network and profits could then be the engine that helps expand the system beyond the original coverage area.